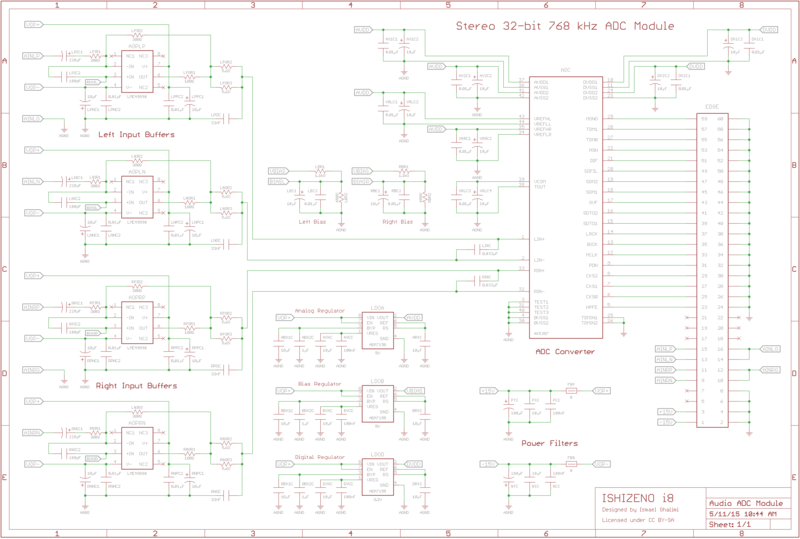 Here is a streamlined version of our audio ADC module without redundant capacitors and ferrite beads. Now, we need to figure out how to implement a power regulator for the operational amplifiers capable of delivering a 15V output. Are you sure of the orientation of the input caps (e.g. LPIC1)? They are supposed to absorb the DC component of the input signal, which is positive in a modular synth. Why are you using two 5.6 resistors instead of one 2.8? Costs? I checked with the AK5397 reference design, and I think the orientation is correct, for all four lanes. Remember that these audio interfaces are balanced. An extra op-amp without this capacitor would be required if we want to support unbalanced inputs as well, which is what you typically find on a synthesizer. But this would require a larger backplate. What do you mean by 5.6 and 2.8 resistors? I’m talking about LPOR2 and LPOR3, for example. Simply because 2.8Ω can be harder to find. But I might simplify that.